This quiche is elegant and delicious enough to serve guests, but also a great pie to have in the refrigerator to slice and eat for breakfast (lunch or dinner) all week long. You can lighten up the filling using all milk rather than half milk and half cream. Consider this your blank slate for any vegetables you have on hand, such as sautéed mushrooms or bell peppers. Heat the oven to 350°F. Brush an 8- or 9-inch pie plate with olive oil. Squeeze the thawed spinach to remove as much water as possible. Shred and scatter the spinach over the bottom of the pie plate. Crumble the feta over the spinach, top with the onions, and dust with a tablespoon of sumac and a healthy pinch of kosher salt. In a medium bowl, whisk the eggs with a teaspoon of salt until they are smooth. Stir in the parmesan, milk, and cream. Pour the eggs over the spinach and feta. Top the eggs evenly with the Swiss, Gruyere, or mozzarella cheese, and sprinkle with a tablespoon of sumac. Bake the quiche for about 40 minutes, or until it is puffy and golden and doesn’t jiggle in the center when moved. Serve the quiche immediately with more sumac dusted over each slice. 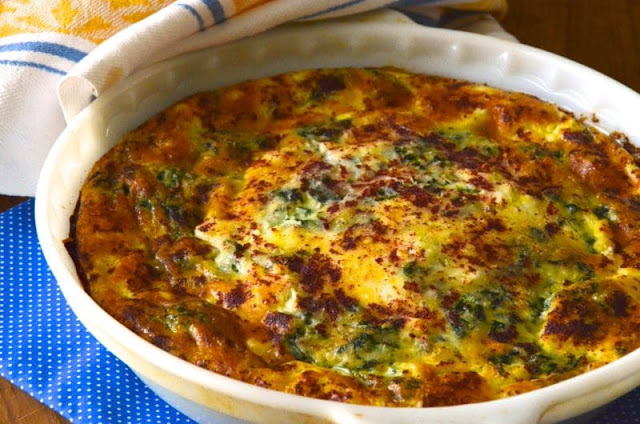 Refrigerate and eat the quiche for up to a week.